Along with its extensive real estate dealings, the Astor family was familiar with the business of running hotels. The first John Jacob Astor started the tradition in 1836 with his Astor House—at the time the most opulent hotel in New York at the time. Nevertheless, the pesky 16-foot wide lot behind the hotel was soon improved. A year later Astor commissioned architect Philip C. Brown to design an annex to the hotel here. If Brown designed any other buildings in his career, they are undocumented. Completed in 1894 the eight-story Romanesque Revival style structure was connected internally to the main hotel. Brown faced the structure in buff-colored brick and stepped away from the Romanesque style long enough to lavish it with Beaux Arts decorations. The architect treated the skinny addition with dignity, adding a dramatic three-story arched opening above the second floor. Decorated with terra cotta, it foreshadows the self-confident theater architecture that would soon flood the Times Square area. The annex offered additional rooms and rentable semi-public rooms. As it was being constructed the Knickerbocker Whist Club was incorporated in the fall of 1893. Organized by Edward A. Smith, Harry S. Williams, John Hopper and J. C. Wilson it started in the Broadway Central Hotel. The card game had fallen out of fashion for a period, but was suddenly regaining popularity. Although the Knickerbocker was the youngest of the clubs, it was among the best. “The Knickerbockers do not say much, but they go right on winning matches with a regularity which is exasperating to their rivals,” said The Times. In 1897 the club moved its headquarters to the St. 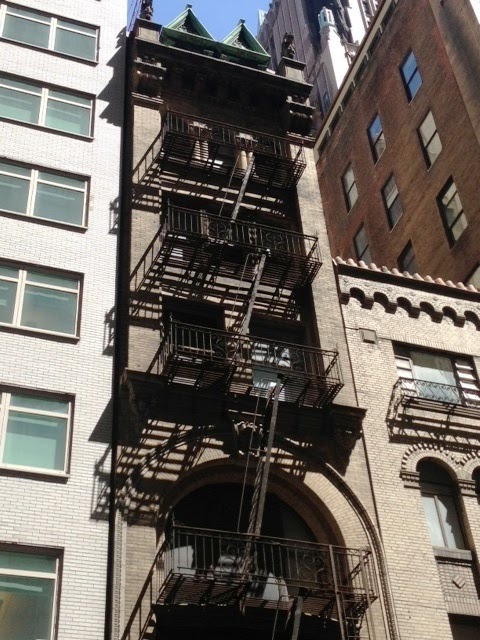 Cloud annex; what The Sun called “larger and better quarters.” The club managed to have its own private entrance to the building on 41st Street. The strait-laced Victorian players were quick to point out that there was nothing illicit in their games. Other rooms were leased as the committee headquarters of the Republican County Committee and the Republican Party in the City of New-York. In 1902 Astor ordered the demolition of the aging Hotel St. Cloud. In its place he stipulated a grand hotel that would cost no less than $2 million. The 16-foot wide annex on 41st Street was allowed to stay; possibly because of its problematic dimensions. It is tempting to think that the Knickerbocker Whist Club had something to do with the naming of the grand new hotel. Whether or not, the 16-story Knickerbocker Hotel opened on October 23, 1906, after a full four years of construction. The first floor of the annex was converted to the service entrance to the new hotel—removing the unglamorous deliveries from the sight of patrons and passersby. At the same time an attic addition was constructed. Two handsome copper-clad dormers crowned by peaked pediments were guarded by menacing griffins on pedestals. John Jacob Astor died when the R.M.S. Titanic sank on April 15, 1912. His 20-year old son, Vincent, immediately became one of the wealthiest young men in America, and new owner of the Knickerbocker. In 1920 he converted the massive hotel to retail space on the ground floor and offices above. The New-York Tribune mentioned that the property included “a 16.8 foot outlet at 143 West forty-first Street,” but gave no details on any related conversion. The block of West 41st Street suffered indignation throughout most of the 20th century as industrial buildings, many connected with the garment industry, replaced older structures. By October 1988 when the Landmarks Preservation Commission met to discuss landmark designation for the Knickerbocker, the 41st Street block was decidedly gritty. During the hearings the owner of the old hotel building objected “to including a small annex on 41st Street,” according to the then-building manager Holly Hunter. Philip C. Brown’s only known work, the skinny St. Cloud Hotel Annex, survives today probably because of its abnormally narrow footprint. Despite its arcane location and less-than-gentle use for nearly a century, it retains its dignified posture and its scary griffins on the roof.